Dr. Bruce N. Waller is Chair of the Department of Philosophy and Religious Studies at Youngstown State University. He received his Ph.D. in 1979 from the University of North Carolina at Chapel Hill. His other works include Consider Ethics: Theory, Readings, and Contemporary Issues, Critical Thinking: Consider the Verdict, You Decide! Current Debates in Criminal Justice, You Decide! Current Debates in Contemporary Moral Problems, You Decide! Current Debates in Introductory Philosophy, You Decide! Current Debates in Ethics, Coffee and Philosophy: A Conversational Introduction to Philosophy with Readings, and Against Moral Responsibility. I’ve taught a wide range of philosophy courses, including Intro to Philosophy, Bioethics, Logic, and Ethical theory. All those courses are fun and I’ve been lucky to have students who seem to genuinely enjoy studying philosophy. The course I teach most often, Critical Thinking, is the course my students usually enjoy the most. It’s a course in which you can actually watch students become significantly more confident and more effective in critical thinking. Above all, it is a course in which students never pose that dreadful philosophical query: Is this course really relevant to my life? It’s no accident that courtroom dramas dominate popular television. The courtroom an ideal setting for the careful study of critical thinking: first, because students find the setting interesting and have no doubt of its importance; and second, because so many key issues in critical thinking are played out in jury deliberations. Jurors must be able to detect misleading and ambiguous statements, separate relevant from irrelevant material, keep in mind who does and does not bear the burden of proof, understand the judge’s instructions, weigh the strengths and weaknesses of appeals to authority, and not only identify fallacies but also understand and appreciate legitimate arguments. 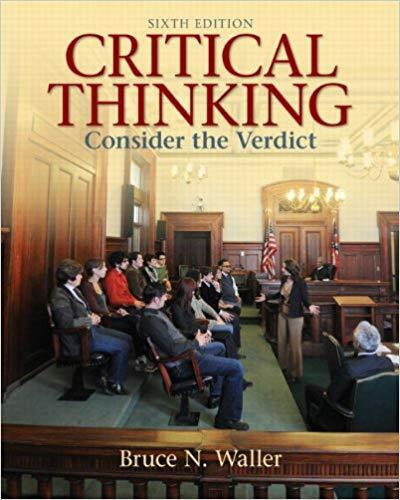 The 6th edition of Critical Thinking: Consider the Verdict, like the previous editions, uses the courtroom and the jury room as a laboratory for work on critical thinking. But as in earlier editions, it is clear that the critical deliberations of the courtroom are not the only place that critical thinking is important, and they are certainly not the settings in which most students will use their critical thinking skills most of the time. Critical thinking is also important in evaluating commercials, deciding how to vote and considering major social issues. Thus while Critical Thinking: Consider the Verdict, 6th editionuses the courtroom and the jury room to study and exercise critical thinking skills, the great majority of the examples and exercises come from other sources: advertisements, political campaigns, letters to the editor, editorials, and ordinary discussions. There are new exercises and examples in every chapter of the new edition, but the most significant change from earlier editions is more attention to cooperative critical thinking. The adversarial system that dominates legal proceedings and drives political campaigns is often valuable. Adversarial argument is by no means the only type of argument, discussion and inquiry we pursue, and even the legal process has in many cases moved toward more cooperative proceedings. And of course, in discussions among friends and family and colleagues, we often find a cooperative discussion, which seeks shared benefits and emphasizes common goals, more valuable than an adversarial process which results in winners and losers. I would be delighted to hear from anyone reviewing, teaching, or studying this book, and am always happy to receive suggestions for improvements as well as new examples for analysis. My email is bnwaller@ysu.edu.